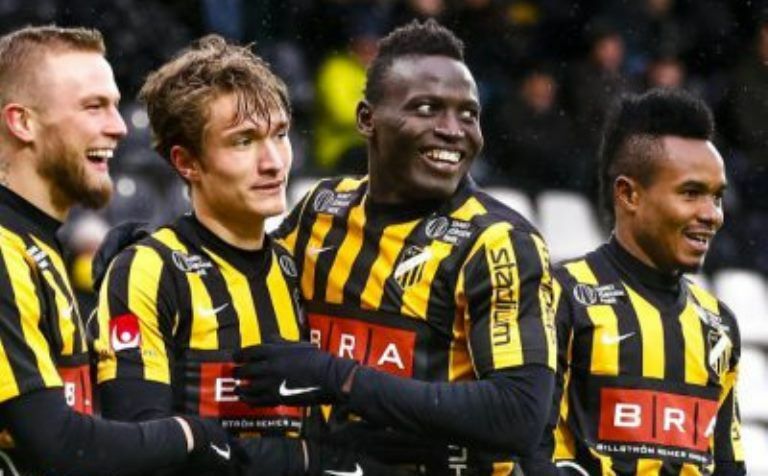 Sierra Leone international and former Örebro SK striker Alhassan ‘Crespo’ Kamara (pictured with teammates) showed he is still as deadly as ever in front of goal as his opening goal helped Hacken see off Atvidabergs 3-1 in their second Svenska Cup Group 8 tie on Saturday. Kamara, 24, who has scored six goals in all competitions, found the net in the 5th minute and put his side on the road to victory at the Bravida Arena. Against Norrtalje, Kamara scored a brace as BK Hacken ease through a 4-0 victory in their first match of the Swedish Cup last weekend. The Sierra Leone star has now scored six goals (6) for Hacken in all competitions including three during their pre-season camp in the Dubai International Cup tournament. Hacken’s next match in the Cup group stage is against former club Orebro SK on Sunday 5, 2017 at the Behrn Arena. The Allsvenskan side will start their 2017-18 league season away to AIK Sunday, April 2, 2017, 15:00 at the friends Arena.